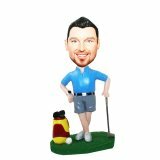 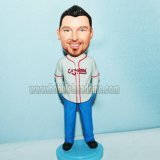 This custom male golfer bobblehead doll is leaning on his butter with the golf bag and some practice balls at his feet. 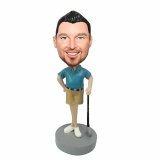 It's perfect for the golfer in your life that enjoy playing golf so much. And the green grass base is modeled on a patch of golf course. All this tiny details make the item a decent gift for your golfing buddy.